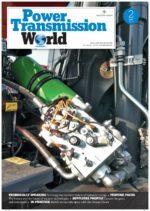 With the market demanding better performance and looking for ways to increase productivity while reducing downtime and maintenance costs, it is critical that fluid conveyance products work effectively in high pressure applications, but also work safely. Eaton’s newly redesigned Flat Face (FF) quick disconnect couplings provide greater performance at higher pressures along with higher flow rates. Eaton’s Flat Face Series quick disconnect couplings are designed to connect top performing hydraulic lines without fluid loss and offer increased pressures to help machine manufacturers meet market demand for high pressure and high impulse pressure solutions. The renewed flat faced quick disconnect couplings reduce pressure drops and decrease energy loss, resulting in lower fuel and energy consumption. Plus, Eaton’s Guardian Seal nickel-free plating offers outstanding corrosion resistance in tough environments for up to 1,000 hours. Common applications include agriculture, construction, vehicle truck, bus, railway, marine, on and offshore sites. The Eaton Flat Face Coupling new design improves performance and enables customers to use it in a wide variety of applications. 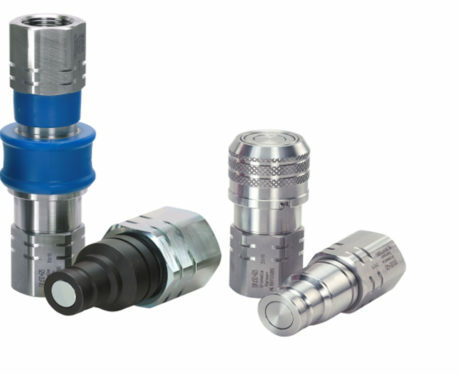 They offer flexible end connections with a wide and complete range of solutions and unlimited possibilities – materials, seals, end connections, CUP, sizes, color coding – to perfectly fit all customer needs. They range from ¼ inch to 2 inches in body size and all end connections are available. The couplings are designed with a simple and very effective color coding system to avoid line crossing. The optional rings are very robust and easy to install with dedicated insert tools. Color rings are a flexible accessory that comes assembled or unassembled. Eaton`s FF couplings are systematically marked with a complete part number, date code and EATON logo for a perfect identification. The Flat Face series is standard and equipped with a sleeve lock feature, the operator needs to match the notch with the ball to be able to disconnect. Versatility of laser marking also allows easy private labelling and/or customer identification (part number, etc.). Eaton`s FF couplings offers a three-year warranty.